Five-time champions Brazil made a shock exit from the FIFA World Cup with a 1-2 defeat to the Netherlands in an ill-tempered quarter-final match which saw Felipe Melo being sent off in Port Elizabeth on Friday. 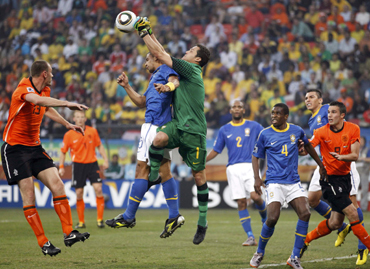 With the win, the Dutch took revenge of their quarter-final losses against Brazil in 1994 and 1998. The Oranje, who were the losing finalists in 1974 and 1978, will now meet either Uruguay or Ghana in the semifinals on July 6. Brazil, who had been well short of producing their fabled free-flowing football in the showpiece tournament, took the lead in the 10th minute through Robinho but conceded two goals in the second session to end their dreams of a sixth title. Brazil set the pace of the match and they were disallowed a goal as early as the eighth minute. Dani Alves slipped through into space on the left and he crossed for Robinho to tap in. Alves was given offside to the dismay of Robinho and the Selecao fans. But two minutes later, the colourful Brazilian fans were up on their feet with Robinho drilling a right footer off a direct pass from Melo past Netherlands keeper Maarten Stekelenburg. Eight minutes into the second half and the Netherlands equalised through a freak goal. Wesley Sneijder curled over a left-footed cross from the Dutch right and Julio Cesar came out for it, got nothing on it and it clipped the top of Felipe Melo's head before creeping into the corner. At the hour mark, Alves had a right footer from just outside the are but the Jabulani ball swerved away from the right post. In the 68th minute, a Arjen Robben corner from the right met with a glancing backheader by Dirk Kuyt at the near post which went past Luis Fabiano and Sneijder nodded the ball home giving no chance to Brazil keeper Julio Cesar. Sneijder, who scored his third goal of the tournament, could have added another one in the 84th minute but he shot straight into the keeper. The Sneijder goal broke the Brazillians hearts at the Nelson Mandela Bay Stadium. 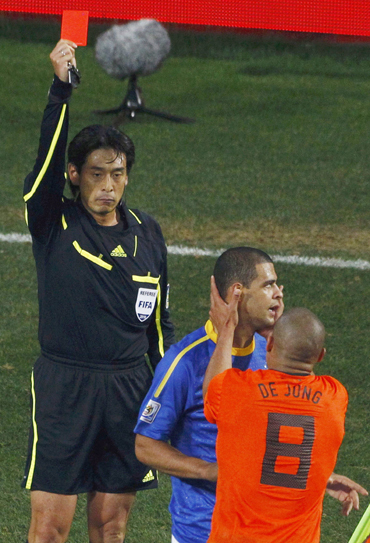 Felipe Melo, who came in for Ramires, was sent off by the Japanese referee for intentionally stamping on Sneijder after the Dutch midfielder fell down on being fouled. One-man down, but Brazil still pressed more men upfront for an equaliser and the Dutch exploited it. Melo let his team-mates down by intentionally stamping on Sneijder in the 73rd minute to earn a direct red card from the Japanese referee Yuichi Nishimura.